January 15, 1929 Martin Luther King, Jr. (originally named Michael King) is born in Atlanta, GA.
February 25, 1948 King is ordained and is appointed associate pastor to his father, the pastor at Ebenezer Baptist Church. June 8, 1948 King graduates from Morehouse College with a Bachelor of Arts degree in Sociology. May 6-8, 1951 King graduates Crozer Theological Seminary with a Bachelor of Divinity degree. June 22, 1952 While attending graduate school at Boston University, King is initiated into the Alpha Phi Alpha Fraternity, Inc.
June 18, 1953 King marries Miss Coretta Scott. October 31, 1954 King is installed as the twentieth pastor at Dexter Avenue Baptist Church in Montgomery, AL. June 5, 1955 King receives his Ph.D. degree in Systematic Theology from Boston University. December 5, 1955 Dr. King is elected President of the Montgomery Improvement Association, the group formed to coordinate the bus boycott. December 20, 1956 Buses in Montgomery are integrated after federal injunctions are issued against many city and bus company officials. In the months before integration of buses occurs, the United States Supreme Court upholds an earlier ruling that declares mandatory bus segregation laws unconstitutional. February 14, 1957 The Southern Christian Leadership Conference ("SCLC") is formed ; Dr. King is named its first president. February –March 1959 Dr. and Mrs. King spend a month in India as guests of Prime Minister Jawaharlal Nehru, studying Mohandas K. Gandhi’s techniques of nonviolent resistance. March – April, 1962 Dr. King is arrested during a demonstration in Birmingham. On April 16, he writes his famous “Letter from the Birmingham Jail,” in which he describes the motivation and defends the need for nonviolent, direct action. October 1, 1962 James Meredith becomes the first black man to enter the University of Mississippi. He is enrolled by order of the Supreme Court and escorted onto campus by U.S. Marshals. Dr. King meets with President John F. Kennedy at the White House, urging him to support civil rights. May 3-5, 1963 At a protest in Birmingham, young demonstrators are attacked with dogs and assaulted with water from fire hoses by order of Eugene “Bull” Connor, Director of Public Safety. Media coverage of the event provokes a national outcry against the tactics employed by segregationist leaders. June 11, 1963 Governor George C. Wallace attempts to stop integration of the University of Alabama by preventing black students and Justice Department officials from entering. Governor Wallace removes himself from blocking the entrance after President Kennedy federalizes the Alabama National Guard. August 28, 1963 At the historic March on Washington, the first large integrated protest march, Dr. King delivers his famous “I Have a Dream” speech from the steps of the Lincoln Memorial on the Mall in Washington, DC. September 15, 1963 The Sixteenth Street Baptist Church in Birmingham, Alabama is bombed, killing four young girls and injuring many worshippers. Dr. King delivers a eulogy for the girls. Summer 1964 The Mississippi “Freedom Summer” Project, a voter registration drive, is organized and instituted by Congress of Racial Equality (CORE) and Student Nonviolent Coordination Committee (SNCC), with the aid of the SCLC. July 2, 1964 Dr. King attends the signing of the Public Accommodations Bill, a part of the Civil Rights Act of 1964, by President Lyndon B. Johnson. August 25, 1964 Dr. King speaks at the Democratic National Convention, where the Democratic Party refused to seat members of the Mississippi Freedom Democratic Party. December 10, 1964 Dr. King accepts the Nobel Prize for Peace in Oslo, Norway. February 9, 1965 Dr. King meets with President Johnson and other leaders to discuss voting rights for African-Americans. March 21-25, 1965 More than three thousand march from Selma to Montgomery under the protection of federal troops. Along the way, their numbers increased to twenty-five thousand. The march ends in Montgomery, where Dr. King gives an address from the steps of the state capitol. Summer 1965 Riots break out in Watts, a neighborhood in Los Angeles, California. August 6, 1965 President Johnson signs the 1965 Voting Rights Act. Spring 1966 To rally support for the election of black candidates, King makes a “People to People” tour of the South. May 16, 1966 Dr. King makes an anti-war statement at a Vietnam War protest in Washington, DC. June 8-24, 1966 Dr. King, many civil rights leaders and supporters continue James Meredith’s “March Against Fear” after Meredith is shot. Summer 1967 Riots occur in 164 U.S. cities. The largest riots break out in Newark, New Jersey and Detroit, Michigan calling attention to the struggles faced by African Americans in Northern cities. December 1967-1968 The SCLC forms and organizes the Poor People’s Campaign, a movement intended to alleviate poverty for Americans of all races and ethnicities. April 4, 1968 Dr. Martin Luther King, Jr. is assassinated at the Lorraine Motel in Memphis, Tennessee. April 7-9, 1968 April 7, 1968, declared a day of mourning, is marked by memorial events and religious services across the country. A silent march is held in Memphis, and on April 9, a funeral service at Ebenezer Baptist Church and a funeral procession take place in Atlanta. November 2, 1983 The Martin Luther King, Jr. Federal Holiday bill, a measure proposed in every legislative session from 1968 by Rep. John Conyers is signed by President Ronald Reagan, declaring King’s birthday a national holiday. However, the first legal holiday nationwide does not occur until January 20, 1986. January 1984 George Sealey is catalyst for convening Alpha Phi Alpha Fraternity brothers Alfred Bailey, Oscar Little, Eddie Madison, and John Harvey, to propose building a national memorial to Dr. King. Their proposal is presented at the Fraternity’s Board of Director’s meeting, under the administration of General President Ozell Sutton. November 12, 1996 President Clinton signs Congressional legislation proposing the establishment of a Memorial in the District of Columbia to honor Dr. King. January 10, 1998 National Capital Memorial Commission votes to recommend Area 1. February 27, 1998 Washington Post article is published: “King Memorial Takes a Step – Senate Bill Would Secure Prominent Site to Honor Slain Leader.” Joint Resolution 41 is introduced before the Senate by Senators Sarbanes (MD) and Warner (VA). Senator Landrieu (LA) was added as a co-sponsor. March 4, 1998 Joint Resolution 113 introduced before the House of Representatives by Congressional members Morella (MD), Dixon (CA), and Cummings (MD) seeking Area 1 authorization. March 5, 1998 Senator Cleland (GA) was added as a co-sponsor seeking Area 1 authorization. March 7, 1998 Coretta Scott King agrees to serve as chairperson of the project’s Honorary Committee/ELC. May 28, 1998 Charter for the Washington, DC Martin Luther King, Jr. National Memorial Project Foundation, Inc. approved. June 22, 1998 House Joint Resolution 113 passed by the United States House of Representatives, giving the project Area 1 status. June 25, 1998 Senate Joint Resolution 41 was passed by the United States Senate, giving the project Area 1 status. October 1, 1998 National Capital Memorial Commission approved Area 1 – Constitutional Gardens. January 15, 1999 BellSouth Corporation sponsored official MLK Memorial Web site http://www.mlkmemorial.org/index.html. February 15, 1999 A poster announcing the design competition is prepared and distributed internationally to all schools of architecture, professional community of architecture, designers and artists. March 4, 1999 The National Capital Planning Commission (NCPC) votes 6-5 in favor of approving the east end of Constitution Gardens as the site for the Memorial, against our recommendation and against the recommendation of their staff. At issue for the five members voting against the motion is an interest to give the Foundation an opportunity to prepare more analysis. However, it is important to note that not all members who spoke voiced their preference for the Constitution Gardens site. April 8, 1999 The Project Team appears before the Commission of Fine Arts (CFA). Recommendation of the Tidal Basin site reviewed and the decision of the NCPC is shared with CFA. The CFA votes unanimously to reject the Constitution Gardens site as an area of consideration. Instead, they gave the Foundation a recommendation to study two additional sites, one on the west end of Constitution Gardens and another on the steps of the Lincoln Memorial. October 7, 1999 Chairman Gantt asks the Commission to approve the Tidal Basin site. He also appoints Robert Gaines to chair a special task force of NCPC commissioners and Foundation members. December 2, 1999 The NCPC votes unanimously to rescind its March 4, 1999, action approving the east end of Constitution Gardens and approves a four-acre site adjacent to the Tidal Basin along with the design parameters, as indicated in the October 21, 1999 agreement. December 2, 1999 A design specifications package is completed and is ready for mailing to individuals registered for the design competition. December 2, 1999 A panel of competition assessors is named. These individuals are from the professions of architecture, landscape architecture and fine arts. December 3, 1999 The site approval receives positive national media coverage, including CNN, NBC, ABC, COX, CBS and NPR. Over 78 articles are published in major newspapers, including the front page of the New York Times, the Washington Post, the Los Angeles Times and the Atlanta Journal and Constitution. September 12, 2000 The entry submitted by ROMA Design Group of San Francisco, California was selected as the winning design. March 2001 The Foundation launched the quiet phase of the fundraising campaign. General Motors was the first major sponsor. April 18, 2002 The Commission of Fine Arts (CFA) voted in favor of the Proposed design for the Memorial. November 2002 Under the auspices of the National Parks Service (NPS), the Foundation initiated the Environmental Assessment of the proposed site. January 7, 2003 A public scoping meeting was convened to solicit comments and concerns about the proposed Memorial program. May 7, 2003 Senate Majority Leader Frist hosted the launch of the national media campaign developed by the Ad Council in collaboration with the advertising firm Saatchi & Saatchi. The PSAs feature Halle Berry and Al Roker. August 28, 2003 Fortieth anniversary of historic March on Washington. Yahoo! puts Memorial on their home-page to help increase awareness for the Memorial and help drive donations to the Project. October 28, 2003 Foundation granted Congressional extension to raise additional funds needed for ground-breaking of Memorial. September 2004 American Urban Radio Network partnership established. September 2004 Tavis Smiley produced radio PSA. October 2004 Morgan Freeman, Samaire Armstrong, and Bishop McClendon produced individual television PSAs. November 2004 Tommy Hilfiger Corporation produces ELC fundraising video. January 31, 2005 Martin Luther King, Jr. National Memorial Foundation Announces $5 Million Fundraising Goal for Black History Month; Adds Aggressive Public Phase to "Build the Dream" Campaign. March 29, 2005 Martin Luther King, Jr. National Memorial Foundation and NCAA partner together: Model of MLK Memorial to be displayed at NCAA Hall of Champions. April 1, 2005 Martin Luther King, Jr. National Memorial Project Launches Faith-Based Initiative on Anniversary of King Assassination; Michigan Faith-Based Community to Raise $1 Million to Help Build Memorial. June 10, 2005 Tommy Hilfiger Corporate Foundation Hosts Celebrity Golf Tournament to Benefit Martin Luther King, Jr. National Memorial; $1 Million Contribution to Help Build Major Memorial on National Mall. August 22, 2005 "Kids for King" Program Launches to Commemorate 1963 March on Washington and ‘I Have a Dream’ Speech. September 23, 2005 Toyota makes special announcement about the Martin Luther King, Jr. National Memorial. November 19, 2005 San Francisco Dream Dinner Nets $2.5 Million to Memorial Project. December 1, 2005 National Capital Planning Commission (NCPC) Unanimously Approves Preliminary Design for the Martin Luther King, Jr. National Memorial. January 30, 2006 Memorial Foundation mourned the passing of Executive Leadership Cabinet Co-Chair, Coretta Scott King. 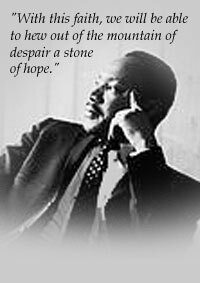 January 17, 2006 Memorial Foundation launched the Dream Keepers College Program to engage college students across the country in efforts to build a Memorial in honor of Martin Luther King, Jr. The program contributed over $45,000 towards Dr. King’s Memorial. R&B recording artist Chris Brown endorsed the Memorial Project by wearing the Dream Keepers t-shirt on his website. January, 2006 Alpha Phi Alpha Fraternity set 2006 fundraising goal of $300,000 towards the Memorial Project, once again exceeding their goal by 140% by contributing $421,381 dollars. February, 2006 Eugene and Agnes E. Meyer Foundation awards grant of $25,000 to Foundation. February 28, 2006 The Los Angeles Dream Dinner raises 3.1 million dollars for the Memorial Foundation. Disney President and CEO Bob Iger chaired the event that is held at the Regent Beverly Wilshire Hotel in Beverly Hills. The Walt Disney Company Foundation donates 2.75 million dollars and underwrote the evening’s gala. February, 2006 $10 million Congressional match achieved with the announcement of The Walt Disney Company Foundation donation. Senators Byrd and Cochran were the driving force behind the match. March, 2006 Memorial Foundation partners with “Charity Folks” for an on-line fundraising auction featuring one-of-a-kind items from celebrities including Morgan Freeman, Usher, Ben Affleck, and Laurence Fishburne. The auction ended on March 31st and raised $68,000 for the Memorial Project. March, 2006 During March 16th Commission of Fine Arts hearing the Memorial Foundation receives preliminary approval from the National Park Service to add a Visitor’s Information Center at the Memorial site which will include a Donor’s Wall to recognize our high level donors who contribute one millions dollars cash to the Memorial Project. March, 2006 Memorial Foundation begins the purchase of long-lead items such as the selection and tagging of oak trees for the Memorial site. April, 2006 Foundation appears before the National Capital Planning Commission on April 6th and receives praise for the beauty and grandeur of the winning design, particularly the relationship between the Mountain of Despair and the Stone of Hope. The NCPC unanimously agrees to grant the Foundation approval to proceed with the final design phase of the project. April, 2006 State Farm Insurance donates one million dollars to the Memorial Foundation. May, 2006 PepsiCo Foundation donates one million dollars to the Martin Luther King, Jr. National Memorial. May, 2006 Burton D. Morgan Foundation awards $50,000 grant to support Memorial Project. May, 2006 BET commits $250,000 multi-year gift to Dr. King’s Memorial. June, 2006 The South African government presents $100,000 check to the Memorial Foundation. June, 2006 Faith-based direct-mail initiative launched. During 2006, the faith-based direct mail initiative and other campaigns contributed $296,000 to the Memorial Project. July, 2006 Alpha Phi Alpha Fraternity re-dedicates future site of Martin Luther King, Jr. National Memorial on anniversary of Fraternity’s Centennial Celebration. July, 2006 ExxonMobil Foundation commemorates the life and work of Martin Luther King, Jr. with a one million dollar contribution to the National Memorial Project. August 7, 2006 The U.S. Department of the Interior certified the documentation of the Washington, DC Martin Luther King, Jr. National Memorial Project Foundation’s ten million dollar appropriation. August, 2006 GE announces donation of one million dollars on August 28th as the Memorial Foundation commemorate the 43rd Anniversary of the March on Washington. August, 2006 Memorial Foundation marks anniversary of “I Have a Dream” speech by announcing 12 Kids for King National Essay Program participants to be flown to DC for the Ceremonial Groundbreaking. Kids for King National Essay Program is extended with announcement of 38 additional participants to be selected in October. September, 2006 FedEx announces major gift of one million dollars to the Memorial Foundation. October, 2006 38 additional Kids for King National Essay Program participants selected for a total of 50 to be flown to the November 13th Ceremonial Groundbreaking of Martin Luther King, Jr. National Memorial. The travel and hotel accommodations for each of these 50 participants and their chaperones (parents and/or guardian) were provided through the generosity of our corporate sponsors, Continental Airlines and J.W. Marriott, Jr.
October, 2006 Memorial Foundation Design Team visits China, touring granite quarries and fabrication sites. November 13, 2006 Thousands attend the Ceremonial Groundbreaking on the National Mall co-hosted by Tavis Smiley and Soledad O’Brien. Those in attendance include Presidents Bush and Clinton, Oprah Winfrey, Maya Angelou, Senator Barack Obama, Diane Sawyer, Dr. King’s children - Yolanda, Martin III and Bernice, Members of the President’s Cabinet, Members of Congress, Greek-letter organization leaders and members, various civil rights icons, spiritual leaders, corporate sponsors, families and friends celebrate the historic event. Kathleen Battle sang the National Anthem while entertainment was provided by BeBe Winans, Naomi and Wynonna Judd, Byron Cage and The Ebenezer AME Church Choir. November 13, 2006 National Dream Dinner Gala is held at the Kennedy Center the evening of the Ceremonial Groundbreaking. Hosted by Nick Cannon, hundreds of supporters, corporate sponsors, family and friends were entertained by Gladys Knight and Michael Bolton. The event raised 7.2 million dollars gross and netted 5.2 million dollars for the Memorial Foundation. November, 2006 Dallas Faith-based initiative contributes over $135,000 to the Memorial Project. December, 2006 GE donates additional “end-of-the-year” gift of $200,000 to Memorial Foundation. December, 2006 Council of Historians recommends Dr. King’s words for the Memorial. January 5, 2007 Executives, supporters and sponsors of the Washington, DC Martin Luther King, Jr. National Memorial rang the NYSE Opening Bell to kick off the inaugural year of construction of the Washington, DC Martin Luther King, Jr. National Memorial. January 14, 2007 CIGNA, Shell Oil Company, and the Verizon Foundation will each announce a $1 million contribution tomorrow to help build a memorial to Martin Luther King, Jr. on the National Mall. The $3 million in new contributions will increase the Memorial’s fund-raising total to $76 million with a needed $100 million to complete the project. January 15, 2007 Sony Pictures today announced the company will donate 2.5% (approximately $650,000) of the opening weekend box office receipts of STOMP THE YARD to the Martin Luther King, Jr. National Memorial Project Foundation. February 15, 2007 The Washington, DC Martin Luther King, Jr. National Memorial Project Foundation, Inc. is proud to announce the selected quotations from Dr. King's writing, sermons and speeches to be engraved onto the Memorial Wall. The Foundation will also announce the sculptor who will carve the image of Dr. King into the Stone of Hope. January 15, 2007 The Washington, DC Martin Luther King, Jr. National Memorial Project Foundation announced today the selected quotations from Dr. King’s writing, sermons and speeches that will be permanently engraved into memorial walls. In addition, the Memorial Foundation announced Master Lei Yixin as the Sculptor of Record who will carve the image of Dr. King into the ‘Stone of Hope’, the centerpiece of the Memorial. - Memorial Foundation’s “Council of Historians” selected quotations that best reflect King’s ideals of hope, democracy, and love, the three main themes of the memorial. February 20, 2007 TV One and the Washington, DC Martin Luther King Jr. National Memorial Project Foundation announced today that TV One has signed as an official media partner of the initiative to build a memorial to Martin Luther King, Jr. on the National Mall. As a media partner to the Memorial Project Foundation, TV One will help build awareness of the planned memorial and raise donations from consumers interested in supporting it. February 27, 2007 The Washington, DC Martin Luther King, Jr. National Memorial Project Foundation, Inc. announced today that the National Association of Realtors (NAR) will donate $1 million to help build the King memorial on the National Mall. Senator Edward M. Kennedy, Congressman James E. Clyburn, and Congressman John Lewis participated in the afternoon ceremony at the U.S. Capitol. Project Foundation, Inc. on the passing of Mr. Jack Valenti. On behalf of the Executive Leadership Cabinet (ELC), Board of Directors and staff of the Washington, DC Martin Luther King, Jr. National Memorial Project Foundation, Inc we express our deepest sympathy on the death of our friend and ELC member, Jack Valenti. Jack's personal recollections of Dr. King and the civil rights movement were an inspiration to all. He was a tremendous supporter of the Memorial Project and will truly be missed. Our condolences to his family. May 7, 2007 The Washington, D.C. Martin Luther King, Jr. National Memorial Project moved another step closer to the needed $100 million for its completion as a result of a $1 million contribution by Prudential Financial, Inc.
May 15, 2007 The Washington, DC Martin Luther King, Jr. National Memorial Project Foundation, Inc. announced today that Tommy Hilfiger, Russell Simmons, Quincy Jones, Joel Horowitz, David Stern and Edgar Bronfman, Jr. will spearhead a one-night only concert to benefit the building of Dr. King’s Memorial on the National Mall. The Dream Concert will be an historic gathering of all-star musicians to be announced in the near future. Statement by Harry E. Johnson, Sr. President and CEO, Washington, DC Martin Luther King, Jr. National Memorial Project Foundation, Inc. on the passing of Yolanda King. On behalf of the Executive Leadership Cabinet (ELC), Board of Directors and staff of the Washington, DC Martin Luther King, Jr. National Memorial Project Foundation, Inc., we mourn the loss of Yolanda King who fought for racial harmony. May 24, 2007 The Washington, DC Martin Luther King, Jr. National Memorial Project Foundation, Inc. announced today it will host a June 27 Houston Dream Dinner to help raise the remaining funds to build the memorial on the National Mall. Dinner Co-Chairs include boxing legend George Foreman, Shell Oil Co. President John Hofmeister, Continental Airlines Chairman and CEO Larry Kellner, and BP America, Inc. CEO Robert A. Malone, Jeff Moseley, President and CEO of the Greater Houston Partnership, is also playing a major role in helping organize the dinner. June 5, 2007 The Washington, DC Martin Luther King, Jr. National Memorial Project Foundation, Inc. announced today that the McKissack & McKissack / Turner Construction Company / Gilford Corporation / Tompkins Builders, Inc. Joint Venture will serve as the Design-Build team for the memorial. June 20, 2007 The Washington, DC Martin Luther King, Jr. National Memorial Project Foundation, Inc. announced today that Stevie Wonder, Aretha Franklin, Carlos Santana, Robin Thicke, Bebe Winans, Cece Winans and Jessye Norman are the first performers to join the all-star line up for The Dream Concert to benefit the building of the Memorial on the National Mall. The Foundation also announced Al Roker as a special guest presenter and Ben Affleck, Shaquille O’Neal and LaDanian Tomlinson have agreed to join the Concert’s Host Committee. The Dream Concert will be held at Radio City Music Hall on September 18, 2007, with tickets available to the general public this summer. Go to http://www.thedreamconcert.com for more information. June 23, 2007 The Washington, DC Martin Luther King, Jr. National Memorial Project Foundation, Inc. announced today that Garth Brooks, Joss Stone, Kenny “Babyface” Edmonds, and Queen Latifah have joined the all-star line up for The Dream Concert to benefit the building of the Memorial on the National Mall. Tickets for The Dream Concert, which will be held at Radio City Music Hall on September 18, 2007 at 8 p.m. ,go on sale to the public on Monday, July 30th at 9:00 a.m.
June 23, 2007 Georgia Congressmen John Lewis and Hank Johnson joined Harry E. Johnson, President and CEO of the Washington, DC Martin Luther King, Jr. National Memorial Project Foundation, Inc., on a tour of Stone Mountain, GA on Sunday, July 22. They surveyed granite quarries to explore potential stone to be used for the four-acre King memorial which will be situated on the National Mall. Stone Mountain is the site symbolically referenced by Dr. King in his historic “I Have a Dream” speech. © 2006 Washington, DC Martin Luther King, Jr.
National Memorial Project Foundation, Inc. All Rights Reserved.